Posted 23 October 2010 in Uncategorized. Well, this may be the only long-form capture of Jack Kirby drawing. A little blurry, but still a treasure. Enjoy. Posted 21 October 2010 in Uncategorized. Jack Kirby was known for many things but one of the more obscure is his unique sense of color. This is in evidence in the artwork he is known to have hand colored, presentation pieces and personal work. He is also known to have provided color guides to printers for various covers, which also feature the same idiosyncratic range of colors. In question are myriad other covers and interiors that feature the same limited range, but there is no way of verifying his hand. Therefore, I thought it would be interesting to create a Kirby color palette. I’ve created palettes like this when I’ve redesigned magazines and illustrator friends have their own. I only used as a guide known Kirby colored personal and presentation pieces. Kirby uses a pretty limited color palate, comprised mostly of secondary and some tertiary colors. The absence of primary colors makes me wonder if his approach wasn’t a reaction to the limitations of the CMYK comic book printing, where so many primaries were used. I started with scanned art and then compared it to printed pieces. There would be a range within a tone, and I picked the middle hue. I was able to boil it all down to 36 colors, although if pushed I think it could be reduced further. This could be used as a reference guide when trying to discern if something might be colored by Kirby. 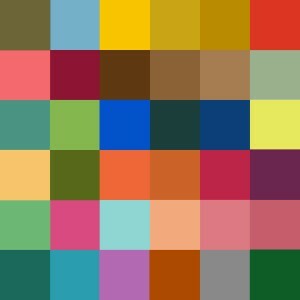 However one would need to explore whether anyone else at the time used a similar color palette. It also offers yet another aspect of what made Jack unique.